The movie starts in 1917, when dancer Jerry Jones (Murphy) is drafted to fight in World War I. Before leaving, he marries his sweetheart Ethel (DeCamp). 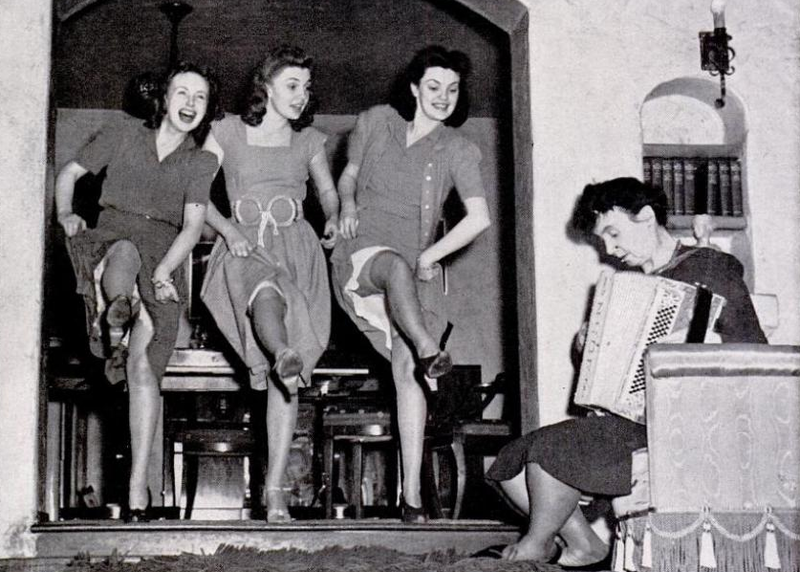 But before the soldiers are shipped overseas, Jones stages an all-soldier Broadway show called “Yip Yip Yaphank.” While fighting in France, Jones hurts his leg and will no longer be able to dance. 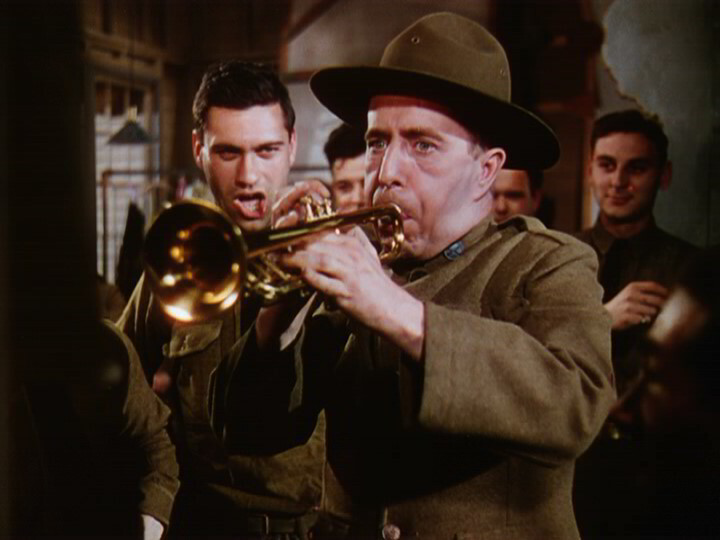 When he returns to the states, he becomes a producer, and his buddy Eddie Dibble (Butterworth) -who was the bugler in the Army-opens a music store. Over 20 years pass, and we see Jones’s son Johnny (Reagan) preparing to fight in World War II. Dibble’s daughter Eileen (Leslie) wants to get married before Johnny goes overseas, but he doesn’t want to potentially leave her as a young widow. 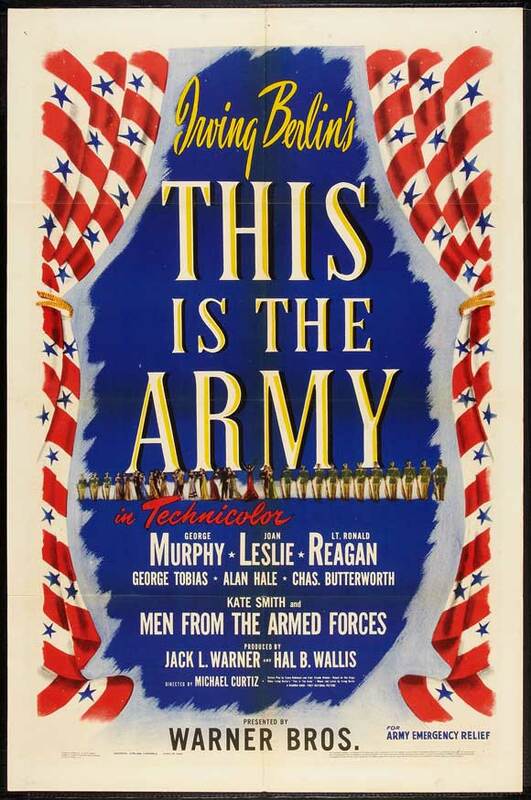 Once the plot is set up, the remainder of the movie is the the actual show “This is the Army” including musical performances, a magic act, a comedian and acrobats. -The movie came from two Irving Berlin shows “Yip Yip Yaphank” and “This is the Army,” according to a disclaimer from Warner Brothers at the beginning of the film. The cast of both the stage and play version of “This is the Army” included soldiers who were performers in civilian life. -Warner Brother’s first three strip Technicolor film. -Warner Brother’s top film of 1943, earning $9,555,586.44. The money made was donated to the Army Emergency Relief. -This is actress Dolores Costello’s last film. -A disclaimer before the film noted that the Army does not condone black face, which is used in a number during the film, but says it is a part of history. -Irving Berlin singing “Oh, How I Hate to Get Up in the Morning” in a rare film appearance. -Real color footage of the attack of Pearl Harbor during the montage of the bombing. -Warner Brother stars such as Joan Leslie, Ronald Reagan, George Murphy, Alan Hale, Charles Butterworth and Una Merkel in color! -One of the character actors does fairly convincing speech impersonations of Herbert Marshall, Charles Boyer, Lynn Fontanne and Alfred Lunt. 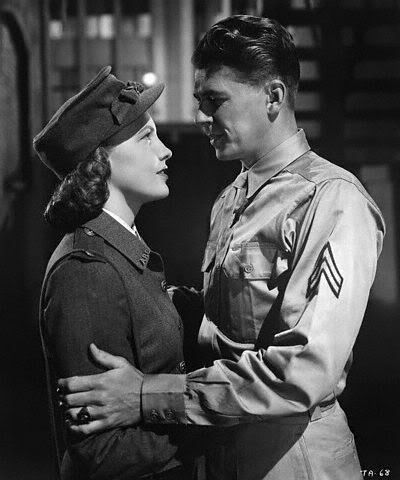 The romance between Joan Leslie and Ronald Reagan took up probably 20 minutes of this film. 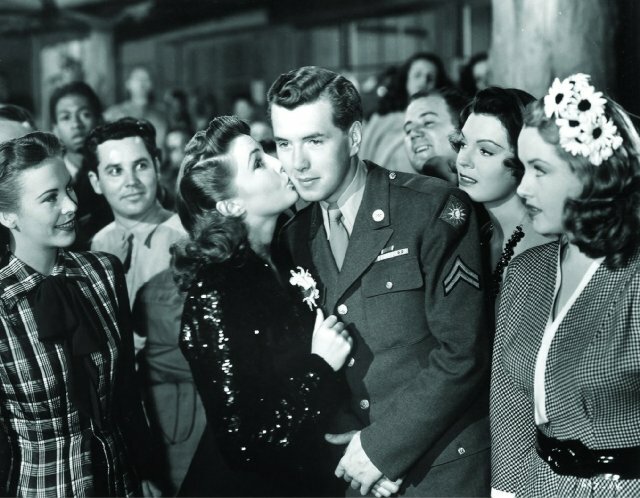 Like the rest of Hollywood during World War II, Warner Brothers was releasing star spangled patriotic films. Around this same time, “Hollywood Canteen” (1944) and “Thank Your Lucky Stars” (1943) were released. All three films focus mainly on musical performances and celebrity appearances (Kate Smith, Frances Langford, Joe Louis) and a very thin plot. 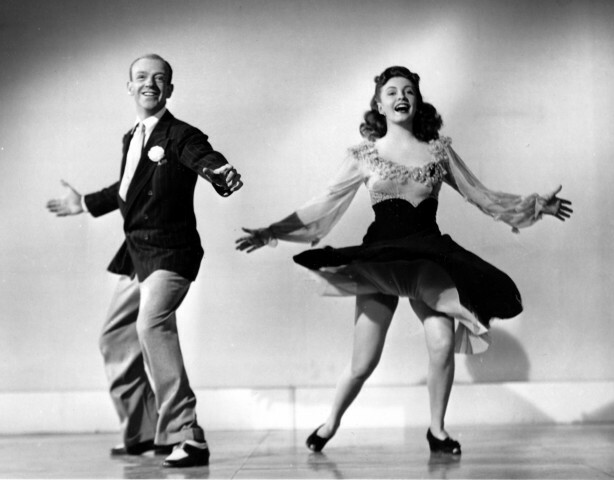 Other studio equivalents would be MGM’s “Two Girls and a Sailor” (1944) and Paramount’s “Star Spangled Rhythm” (1942). But while the other four listed musicals still hold attention and are fun, somehow “This is the Army” falls flat. The initial plot set up seems promising, but after the first 45 minutes, the movie turns into musical number after number after number with little plot interlude. That is where “This is the Army” differs from similar films. For example, in “Hollywood Canteen,” you have the romance of Joan Leslie and Robert Hutton between the different performances. 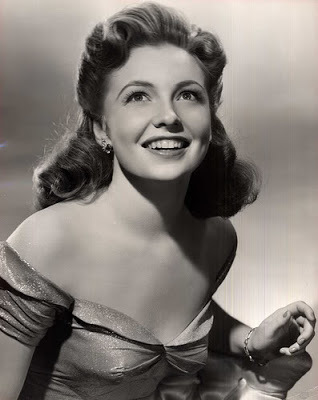 The lack of plot interlude is honestly disappointing, because actress Joan Leslie and some of the other leads are maybe on screen for 20 to 30 minutes in the two hour and five minute film. On a more technical side, the DVD print that came in the 2008 “Homefront Collection” isn’t very good. In close shots, the color is gorgeous. But in a few scenes, it looks over exposed and washed out. When I first saw this movie in 2009, I really enjoyed it. Now I found I was rather bored. I appreciate any patriotic World War II film, because it gives you a feel of what audiences wanted during the war. After all, this was Warner Brother’s top film of 1943, so apparently audiences enjoyed it at the time. Or maybe they were watching the movie so their money would be donated to the Army Emergency Relief. I feel that the movie could have been better structured. Actors like Una Merkel, Dolores Costello, George Murphy and Charles Butterworth are wasted in this film because they barely have any screen tirme. Less songs and more plot in this slightly over two hour film would have been more enjoyable. Do you ever watch a movie and think, “Man, those actresses could be sisters.” or “It’s hard to tell those two men apart because they look so similar.” These actors could maybe even switch places just like Billy and Bobby Mauch did in “The Prince and the Pauper” (1937). Younger movie viewers of today may say that all old actors all look the same. This isn’t true of course, but there are some that certainly look very similar. This is a result of being groomed by movie studios to have glamour and charm. Actors and actresses also are given names that sound similar and can cause confusion. Here is a list of actors who look similar and have confusingly similar names. – I think the thing that is funniest is that two of the women have the same first name. I can tell the difference between them, but you have to admit they all look very similar. All three women are very thin, blonde and rather tan. Vera Miles had one of her first acting roles on the TV show “Alfred Hitchcock Presents” and looked very similar to Vera-Ellen because she was thinner than I had ever seen her. However, all three women had different careers. Vera Miles stared mostly in dramatic roles, and occasionally in bit parts on TV (like a romantic interest for Fred MacMurray on “My Three Sons“) . After Grace Kelly, she was Alfred Hitchcock’s favorite actress, according to IMDB. Unfortunately, she had to turn down roles because she was pregnant. Miles is still living. Vera-Ellen was a ballet dancer and was in several musicals. In earlier movies like “On the Town,” Vera was thin, but looked healthy. In later movies, like “White Christmas,” she was almost dangerously thin, because she was anorexic. She had the smallest waist in Hollywood in the 1940s and 1950s and suffered from early aging because of anorexia ,according to IMDB, so you will notice that she wears turtle necks to cover it. 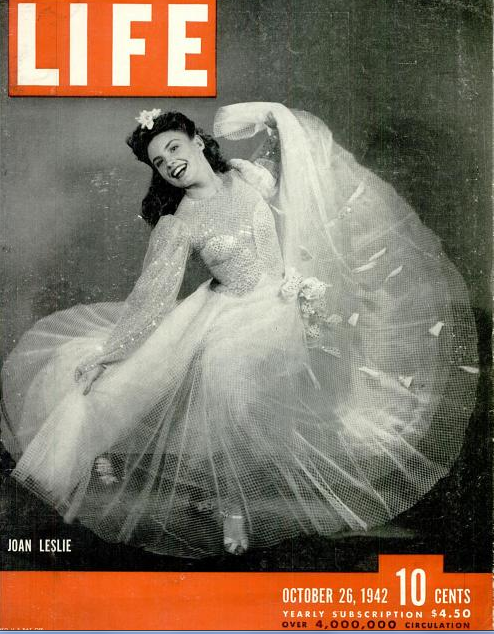 After she retired she had severe arthritis and was practically a recluse, dying in 1981. 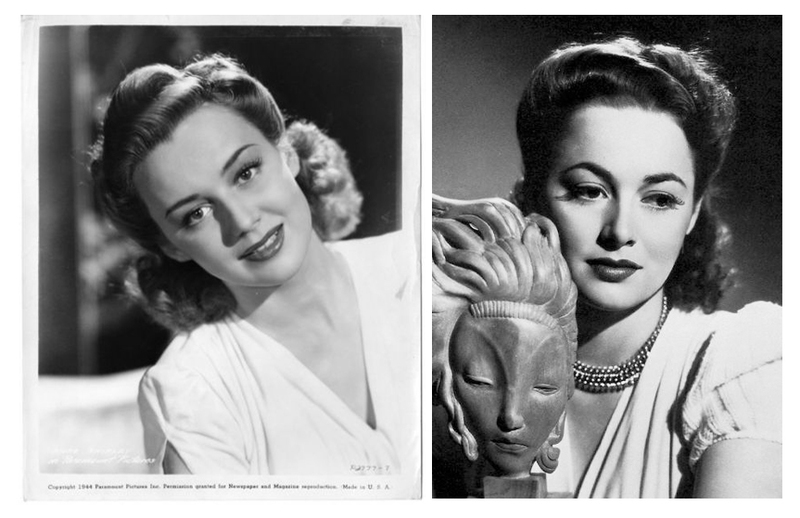 -Anne Shirley never had the same star power or acting skills as Olivia de Havilland, but you can’t deny their similar appearance. Particularly the way Anne Shirley looks in “The Devil & Daniel Webster.” The two starred together in the irritating comedy “Government Girl” (a movie that de Havilland hated and had to make because of contractual agreements. She purposefully acted ridiculous in the movie). 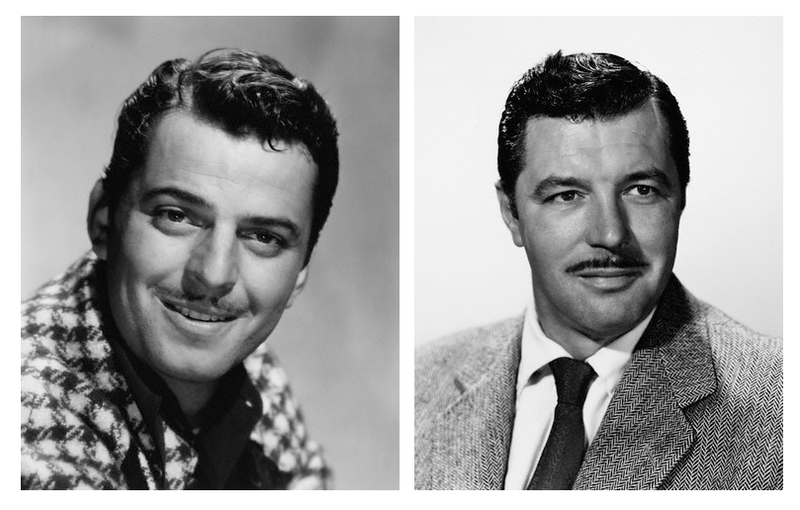 – Both men played small romantic roles in the 1940s when most of the lead actors like Clark Gable and Robert Taylor were fighting in World War II. 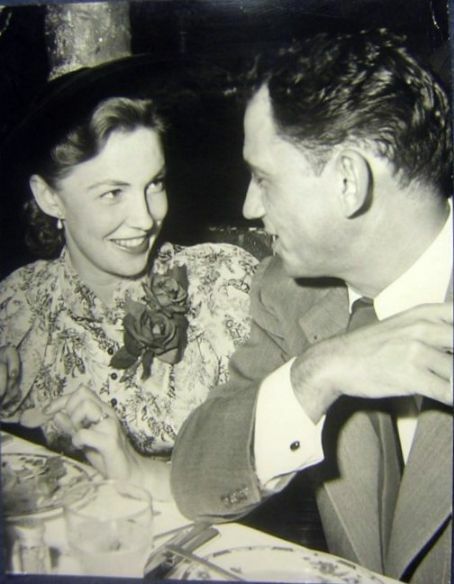 Carroll starred with Esther Williams in “Fiesta ” (1947) and “Flying Tigers” (1942) with John Wayne. Craig was in several “feel good” movies in the 1940s like “Our Vines Have Tender Grapes” (1945) with Margaret O’Brien and “The Human Comedy” (1943) with Fay Bainter. -In the 1930s, Joan Blondell had a curvy, sassy look of her own; pretty but also comedic. 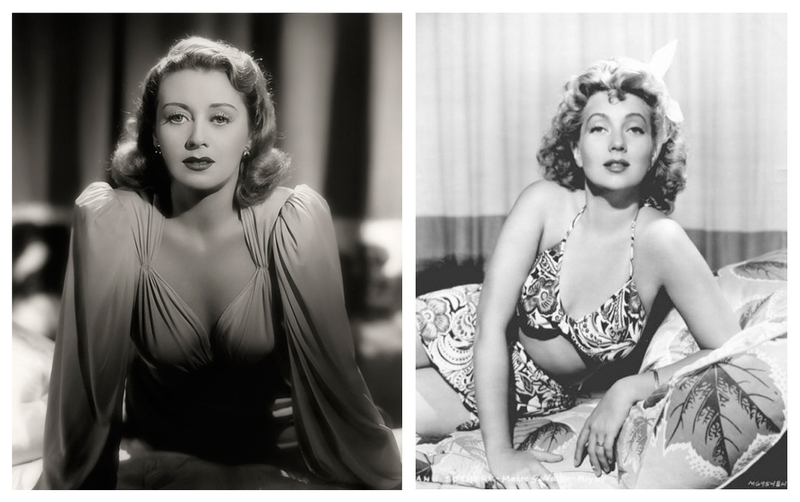 In the 1940s, Blondell was a bit more curvy and switched from the tight 1930s hair styles to long and wavy. Her 1940s look was similar to Ann Sothern, who also was a bit curvy. Both actresses can be found in light comedic roles. What actors do you confuse? What names can you not remember? Let me know! Check out the Comet Over Hollywood Facebook page and Radio Waves Over Hollywood Facebook page for “Comet’s” radio show.